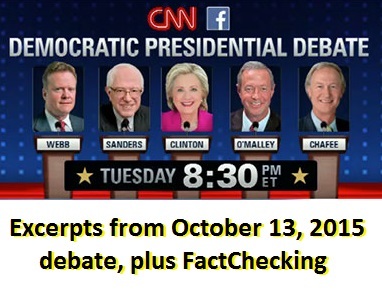 The CNN Democratic presidential primary debate took place on Oct. 13, 2015 in Las Vegas, Nevada. Five candidates attended (we include responses from some non-attending candidates below). An empty podium was made available for Vice President Joe Biden, if he chose to enter the race and attend the debate. The biggest applause line of the night was Bernie Sanders declaring that America was "tired" o fhearing about Hillary Clinton's email. As a result of this debate, Jim Webb is considering switching to an Independent instead of a Democrat. Hillary Clinton: It's big government to intervene on woman's right to choose. Bernie Sanders: Almost all new wealth goes to the top 1%. Martin O`Malley: Economic injustice is tearing our country apart. Martin O`Malley: Fight banks that are too big to jail & too big to fail. Bernie Sanders: Combat institutional racism and reform justice system. Hillary Clinton: We need a New Deal for Communities of Color. Martin O`Malley: Settled lawsuit with ACLU about race-based arrests. Bernie Sanders: I'm not part of casino capitalism that wrecked our economy. Bernie Sanders: Fraud is the business model of Wall Street. Bernie Sanders: Make Wall Street bail out Wall Street; but middle class did. Hillary Clinton: Every once in a while we have to save capitalism from itself. Hillary Clinton: Let bank regulators send bank executives to jail. Hillary Clinton: Investigate "shadow banks" and break up big banks. Lincoln Chafee: I voted for Glass-Steagall, but I had just arrived in Senate. Martin O`Malley: Separate casino banks from good ones: support Glass-Steagall. Bernie Sanders: America has more people in jail than any country on earth. Hillary Clinton: Get body cameras on police; tackle mass incarceration. James Webb: I risked political suicide for criminal justice reform. Martin O`Malley: My zero-tolerance policy didn't cause Baltimore riots. Martin O`Malley: Black Lives Matter, like in Baltimore. Bernie Sanders: I would vote for recreational marijuana, to reduce jailings. Hillary Clinton: Stop imprisoning marijuana users. Jill Stein: Call for an end to school privatization. Bernie Sanders: 1950s "high school for all" is now "free college for all". Hillary Clinton: Refinance all college debt to help 40 million new grads. Martin O`Malley: Don't burden our kids with massive college debt. Jill Stein: Immediate halt in all new fossil fuel exploration. Bernie Sanders: Address climate change so we can leave planet to our kids. Bernie Sanders: Climate change is a moral issue: tax on carbon. Hillary Clinton: Obama & I crashed China meeting and got climate change deal. Hillary Clinton: Take opportunity of climate change to raise our economy. Hillary Clinton: I now oppose Keystone, but I withheld opinion at first. Hillary Clinton: Chinese participation is essential to climate change. James Webb: Strong supporter of nuclear power & all-of-the-above. James Webb: To solve climate change, India and China must participate. Martin O`Malley: Green revolution: 100% clean electric grid by 2050. Martin O`Malley: Support sustainable green building, architecture and design. Bernie Sanders: We're the only major country without paid family leave. Hillary Clinton: Even the odds so each child can live up to potential. Hillary Clinton: US needs paid family leave, to join rest of the world. Hillary Clinton: Design paid-leave system that doesn't burden small business. Martin O`Malley: I'm a husband and a father, and an effective leader. Martin O`Malley: Don't penalize working women for having kids. Bernie Sanders: Putin regrets invading Crimea & the Ukraine. Hillary Clinton: Stand up to Putin's bullying in Syria and elsewhere. James Webb: Greatest strategic threat: resolving relationship with China. Hillary Clinton: I absorbed new info and changed my mind to oppose TPP. Bernie Sanders: Citizens United means billionaires donate for THEIR interest. James Webb: Money has corrupted our political process. James Webb: Less executive authority, more working together. Bernie Sanders: I want to shield gun shops from lawsuits, not manufacturers. Bernie Sanders: Deal federally with straw-man gun purchasers. Bernie Sanders: Bring together rural states & urban states with common sense. Hillary Clinton: Don't shield gun manufacturers from lawsuits:I vote that way. James Webb: Respect gun rights but we need background checks. Lincoln Chafee: My "F" rating from NRA means I vote for common sense. Martin O`Malley: The game is rigged in court, against gun victims. Bernie Sanders: Mental health coverage would stop suicides AND homicides. Jill Stein: Immediate weapons embargo to the Middle East. Bernie Sanders: I opposed Vietnam as conscientious objector. Bernie Sanders: Shut down the NSA surveillance program. Bernie Sanders: Snowden showed us our civil rights are being undermined. Bernie Sanders: PATRIOT Act was 99-1, and I was the one. Bernie Sanders: I pushed bill for $15B for veterans' healthcare services. Hillary Clinton: PATRIOT Act was needed, but Bush chipped away at warrants. Hillary Clinton: Snowden should face the music; he broke the law. James Webb: I wrote and passed the post-9-11 G.I. Bill. James Webb: Destroy government records of personal info after some time. Lincoln Chafee: PATRIOT Act was 99-1, including me, but reform it now. Lincoln Chafee: Bring home Snowden; he showed government illegalities. Martin O`Malley: Snowden fled to Russia so it's obvious what he is. Bernie Sanders: 2007: No comprehensive reform: guest workers are semi-slaves. Hillary Clinton: Include undocumented immigrant kids in state college tuition. Hillary Clinton: Include undocumented immigrant kids in healthcare coverage. James Webb: No country is a country without defining its borders. Martin O`Malley: Support DACA and DAPA, and comprehensive reform. Martin O`Malley: In-state college tuition for immigrants, not free tuition. Jill Stein: Guaranteed jobs for all who need work. Bernie Sanders: Obama rebuilt jobs; but middle class is disappearing. Hillary Clinton: It hasn't been this bad since the 1920s; so vote Democrat. Lincoln Chafee: Rhode Island had 2nd best job growth under my watch. Bernie Sanders: Political revolution: millions of people vs.few billionaires. Bernie Sanders: American people are tired of hearing about Hillary's email. Bernie Sanders: I do not have a Super PAC nor raise money from billionaires. Hillary Clinton: I'm a progressive who likes to get things done. Hillary Clinton: First woman president would be an "outsider". Hillary Clinton: My email methods were a mistake, but it's over-politicized. Hillary Clinton: As a woman, I am the ultimate outsider. Hillary Clinton: America's best days are still ahead. James Webb: Democratic Party gives voice to people with no voice. James Webb: I've always been willing to take on unpopular complex issues. Lincoln Chafee: I've been a mayor, a Senator, & a Governor--with no scandals. Lincoln Chafee: I'm a block of granite on the issues, but not on party. Martin O`Malley: Democrats don't denigrate women or immigrants or Muslims. Bernie Sanders: Defend against chained CPI, and expand Social Security. Hillary Clinton: Enhance benefits for poorest recipients. Hillary Clinton: Wealthy pay too little and middle class pay too much. Lincoln Chafee: Repeal Bush tax cuts that favor wealthy. James Webb: Our greatest day-to-day threat is cyber-warfare. Bernie Sanders: Syria is a quagmire within a quagmire; don't get involved. Bernie Sanders: Support force only when we are threatened & have coalition. Hillary Clinton: No-fly zone in Syria, but no American troops on the ground. Hillary Clinton: We're already involved in Syria; deal with Russia there. James Webb: Strategic failings by U.S. allowed Russia into Syria. James Webb: I supported invading Libya with Congressional war resolution. Lincoln Chafee: There was no real evidence of WMDs in Iraq before invasion. Lincoln Chafee: Iran nuclear deal. Lincoln Chafee: American credibility suffered because of Iraqi WMD lies. Lincoln Chafee: We need a new paradigm to stop these Mideast wars. Lincoln Chafee: I never believed Saddam had WMDs. Martin O`Malley: Don't search world for monsters to destroy, like Iraq War. Martin O`Malley: No-fly zone in Syria too hard to enforce; stay out entirely. Bernie Sanders: We should not lead the world in childhood poverty. Five candidates in Las Vegas, October 13, 2015.